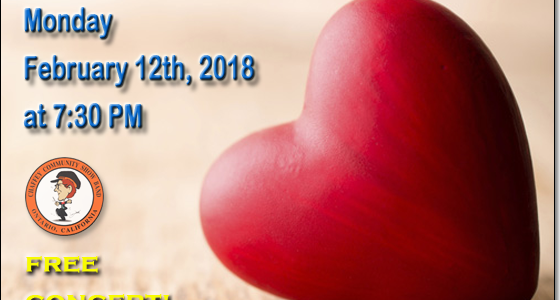 The Ontario/Chaffey Community Show Band is proud to present “We Wish You Love” on Monday February 12th at 7:30 p.m. in Merton Hill Auditorium located at the corner of 5th Street and Euclid Ave on the campus of Chaffey High School in Ontario. Early birds are invited to come at 7:00 p.m. to enjoy complimentary cookies and Starbucks coffee and listen to the “Woodwind Celebration” in the lobby of the auditorium. Admission to the concert is FREE to the public.